TDS FROM NUMEROUS political parties have raised concerns in the Dáil over the last two days that the government is trying to “ram” through a vote on Ireland joining the permanent structured cooperation arrangement (Pesco). 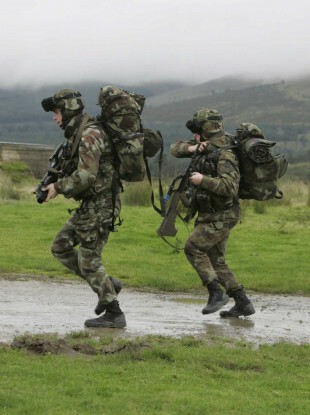 Last week, TDs and senators voiced their concerns about Ireland signing up to the European defence pact after Cabinet gave the go-ahead for Ireland to take part in the EU plan. The plan has raised concerns here that it could undermine Ireland’s policy of neutrality. The Taoiseach has maintained that signing up to the deal will not challenge Ireland’s neutrality and will not mean Ireland joining a European army. A heated debated on the issue kicked off two days ago with news the government wants a vote on the issue this week. A number of TDs said there has not been sufficient debate on the issue and pointed out that the public are unaware of what such a plan could mean for Ireland’s future. Wexford TD Mick Wallace said he was astonished at the video Europe is using to promote Pesco and was even more shocked that a small country like Ireland would consider signing up to it. Wallace said this is followed by images of fighter jets, drones, Apache helicopters, armed troops running off military transport helicopters, aircraft carriers and warships, “all to the tune of the kind of aspirational and emotive modern classical one would get on an ad for a new Mercedes”. He said there is no detail as to what exactly it will mean for those who sign up, especially in terms of actual warfare. The Taoiseach Leo Varadkar said he wants Ireland to be involved, stating that it is time that Europe stops relying on the US for its defence. My view is that a Europe that is worth building is a Europe that is worth defending. For a very long time, all of Europe has relied on the United States to provide for its defence. There are real threats to European security and, over time, rather than relying on the United States to defend Europe and pay for European defence, Europe should provide and pay for its own defence and not be dependent on the United States in the way it has been since 1945. That is what Pesco and European security and defence co-operation are all about. It is Europe starting to take responsibility for and control over its own defence, not relying on the United States in the way it has done until now. Ireland has a long-standing tradition of non-alignment and neutrality, he said, adding it is something his government will defend. He said Pesco will be different for Ireland as we can join in an opt-in, opt-out basis. I can assure the Deputy we are not going to be buying aircraft carriers, we are not going to be buying fighter jets and we are not going to be shopping around military trade fairs for any of these things, as that is not in our interest. Solidarity-PBP’s Richard Boyd Barrett took particular issue with the vote being rushed through the House. “This is a move to ram through a vote to move towards joining a European Union army while quadrupling military spending,” he said on Tuesday. “It is deeply cynical. I wonder if the quid pro quo for European support on Brexit negotiations is that we sell out our military neutrality and ramp up military expenditure,” he asked. Boyd Barrett said he had read the brief on Pesco and said he thought is was “absolutely outrageous” that Cabinet agreed to it when there has been no public consultation. The Dun Laoghaire TD was not the only deputy who had concerns about a vote being rushed through the House. Independents 4 Change Clare Daly said the government’s move was a “departure beyond anything I have seen”. She said she was assured some weeks ago there would be adequate time to discuss the matter. “I object to it in the strongest possible terms,” she said. Sinn Féin’s Aengus Ó Snodaigh and Labour’s Brendan Howlin called for the issue to be discussed at the Oireachtas Defence Committee. Green Party leader Eamon Ryan said the matter should go to committee so that the Defence Forces and the Army Chief of Staff could be invited to make submissions. “I believe there should be adequate time to debate it in the chamber,” the Taoiseach replied. Boyd Barrett replied by stating that the issue is as big an issue as Brexit. “I don’t think so,” said the Taoiseach. The Green Party, the Social Democrats and Fianna Fáil all voiced concerns about there not being sufficient time to discuss the issue. Eamon Ryan said he understands the government intends to sign up to the agreement at the European Council meeting on 11 December. If the defeat of the first Lisbon Treaty referendum has taught us anything, he said, it is proper debate on such measures is needed. Howlin said there is no rush to sign up to the proposals this side of Christmas. “I understand there is a request to do so, but we may choose to postpone our signing up until after the event. We must have a proper debate, with experts invited in and cross-examined,” he said. Varadkar said Pesco “is not a new issue” adding that it had not been “dreamt up” in the past couple of months. “This is in the Lisbon treaty. The treaty was ratified by the Irish people in 2009. There has been ample opportunity for a debate since then. There has been plenty of debate about this matter since the Lisbon treaty was ratified in 2009. There is a time for debate and there is a time for a decision. I do not believe further debate would change anybody’s mind, nor would it allay fears based on any conspiracy theories,” he said. Boyd Barrett made the point that the public knows nothing about the issues at play. Minister of State at the Department of Defence Paul Kehoe said there are “rumours” being circulated that Pesco will threaten Ireland’s neutrality. “That could not be further from the truth. Sweden and Austria, which have neutrality policies similar to ours, have already signed up to Pesco,” he said. The Business Committee reconvened yesterday to sort out the disagreement as to whether a vote on Pesco will proceed this week and whether it will be referred to an Oireachtas committee for further scrutiny. A motion put down by Boyd Barrett to delay the vote on Pesco until 2018 was defeated by the Dáil yesterday by 73 votes to 49. However, a government motion agreed to refer the issue to the Oireachtas Defence Committee. Minister Kehoe said Pesco was not being cooked up by the government in “smoke-filled room” stating that not one politician has come to him in the last few months to voice their concerns about the plan. He said Ireland plans to partake in six of the 16 projects under Pesco which include being involved in the EU centre for training excellence, the deployment of disaster relief, underwater surveillance schemes, the upgrade of marine surveillance and cyberthreat projects. The minister said it had nothing to do with an EU army and said that debate was had during the Lisbon Treaty referendum. He said it was important that Ireland sign up before 11 December as it would ensure Ireland would be able to “play its part in some projects” and only those who sign-up will have a say on the progression of Pesco. A two-hour Dáil debate is due to be held today on the issue before the matter goes to a vote. Email “'We're being asked to sell out our neutrality': Government accused of trying to rush EU defence deal vote”. Feedback on “'We're being asked to sell out our neutrality': Government accused of trying to rush EU defence deal vote”.